I allow myself to connect with my pure Inner Divine Heart of Oneness. I am aware of the expression of the Divine Heart through me, as me. I connect with my heart, and am aware of embodying its pure Love intention for All. I am filled with Joy as I embrace my heart’s Love. Some of the most inspiring and personally rewarding experiences of my life have been, and continue to be, volunteer activities. One of the earliest I recall was called “Holiday Hospital Project”. Participants visited local hospitals on Christmas day, singing carols and delivering gifts to those who were hospitalized during this holiday. It was an amazing experience. I’ve also volunteered with a local hospital’s hospice patients. As a hospice volunteer I would visit with a terminally ill patient while their primary caregiver received a few hours of respite. The caregiver could go shopping, take in a movie, connect with a friend, enjoy a walk or simply disappear into another room for a well-deserved nap. Sometimes my task was to read to the patient, or watch a sport on TV, or just to be there sitting with them while they napped. I served on the board of a local environmental group. I wrote newsletters for a Native American action group. Currently, I’m a “chemo angel”, committed to sending weekly notes or small gifts to people experiencing chemotherapy. (visit chemoangels.com If you want to know more, or if you know someone experiencing this treatment who would like to receive snail mail encouragement.) Before doing much volunteer “work”, I used to think that volunteers were the “givers”. But, once I got into ANY volunteer task or activity, I was the recipient – filled with joy as I “embraced my heart’s Love”. Such “work” is so personally enriching and rewarding, it’s not something that can easily be put into words. I encourage anyone and everyone to find a volunteer outlet and to participate. There are so many options, something for everyone. Volunteering is an opportunity to discover your own personal creativity. You can express your Self in ways you may not have opportunity to do in a “job”. You can set your own hours and boundaries. (Just a warning that protecting your personal boundaries is one of the earliest lessons in volunteering. You will be SO appreciated and any organization will just want MORE of you. SET YOUR OWN BOUNDARIES.) That being said, when you “give” yourself to a volunteer role that suits you, you will find yourself connected with your heart and its pure Love intention, you will “embrace your heart’s Love” in beautiful ways you never anticipated. I know I have, every time. Accept your light and my lightness! Feel your Self expand! As you perceive change around you, remain anchored in your Being of Light. Allow yourself to sit peacefully in the still place of nothingness as life moves quickly around you. Spring has rather suddenly arrived where I live. The sun has been shining, crocus and daffodils are beginning to bloom, the first of the cherry blossoms are peeking out. It’s easy to accept my light and lightness on days like this. But what about other days when it’s rainy or cold or windy? Or what about the change all around me. They say the only thing permanent is change. I watch the news and it doesn’t feel like “good” change. So, I sit by the window where the sun shines through and warms me. And I think “sunshine on my shoulders makes me happy”. I can have that thought even on cloudy days, and it warms me and I feel lighter. Seems like I’ve been spending a lot of time “in the still place of nothingness” lately. Sometimes I feel guilty, like I “should” be doing something more productive. Then I think that being a little corner of peace and light in a fast-paced hectic world IS doing something. And I do my best to let that peace and light carry with me when I wander out into the world. If you think you might possibly like to be a guest contributor at some point for a future Journey (taking your next courageous step! ), as Mary is doing now, please email me: susan@withpearls.com. We can talk. Smooth. Easy. No pressure. Just take that step and we’ll see how it goes from there. Allow yourself to connect with your pure Inner Divine Heart of Oneness. Be aware of the expression of the Divine Heart through you, as you. Connect with your heart, and be aware of embodying its pure Love intention for All. Be filled with Joy as I embrace my heart’s Love. Sometimes I wear a mala. Sometimes I wear a bracelet of meditation beads. Sometimes I carry an angel in my pocket. 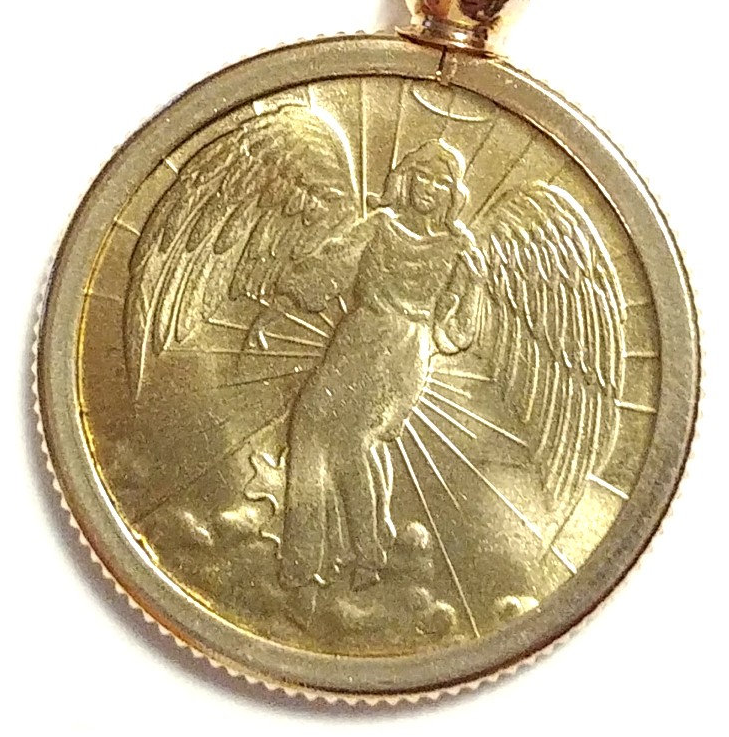 Actually, it’s a small coin-like object with the image of an angel on it. Sometimes I give that angel away, knowing there are more of these symbols at home waiting for me to share them. Angels, or prayer beads, or crystals, or other symbols, they are simply that, symbols, not the “real thing”. Each such symbol stands to remind me of the expression of Divine Heart through me. While I hold these things as precious, in reality they are all basically triggering mechanisms. They are there to remind me of my connection with my heart. Well, not just my heart, but a higher source of love, light and joy in my life. I am a massage therapist and these types of items help to remind me that, when I share massage with a client, it’s not ME, but “pure love intention” doing the massage. The massage or Reiki touch comes THROUGH me, not FROM me. In the vernacular of the “woo-woo” world, I suppose I might be considered a “channel” of healing touch. Yes, I did the homework, I studied the anatomy, took the exams, qualified for the license. But, ultimately, I would contend that “it’s not ME”. It’s the joy and Love that any of us can connect with at any time and in any place. It’s magical — and yet, it has the potential to be so mainstream. A “healer” doesn’t so much do healing, as they open the space for a person to tap into their own healing abilities. And when I’m in touch with that, I cannot help but be joyful and to wish that All of us would tap into that Divine Love and joy. What a blessed world it is, when we practice that connection! I accept my light and my lightness! I feel my Self expand! As I perceive change around me, I remain anchored in my Being of Light. I allow myself to sit peacefully in a still place of nothingness as life moves quickly around me. Lightness! I love it! I live where winters are mostly grey and wet and days are short. When the sun shines, like today, I rejoice in the sunlight, and I feel lighter. This seems to be true for most of the people who live here. I consider myself a being of light and often wonder that I have landed in this environment for so many years. So when the change to autumn and winter darkness comes, I kind of hibernate a bit. Each year it gets easier to “sit peacefully in a still place of nothingness” as life moves around me. I also find it easier to practice “mindfulness” in the peacefulness of my home. I’ve had a tendency to “multi task”, doing several things simultaneously. In the quiet peace, I’m much more able to be mindful of one thing at a time. When I eat, I try to savor the food and not just chew it down while I focus on laundry or a phone chat. When I practice artful projects, they turn out much better if I’m in the stillness of the project in my hands. I’m certainly not perfect at this peaceful still place of nothingness, but that’s why it’s called “practice”! I am committed to exploring the fears within that may arise in the course of this Journey of Courage, to contemplate those fears and to call upon my higher, Divine Self to better understand, accept and transform those fears. I am committed to reading the Guiding Thought each day for the next 40 days. On those days when I may be traveling or away from home, I commit to engaging with the Guiding Thought in advance, or while away, in order to provide a public response to that Guiding Thought on a daily basis. I will read the Thought, reflect on it, and record the thoughts and reflections that arise on a daily basis. I dedicate any merit that may arise from my contemplation of the daily Guiding Thoughts to the highest good of ALL BEINGS, myself included.